Fact: Malcolm Gladwell is much more interesting than that guy in the Dos Equis commercials. For over a decade, Malcolm Gladwell has covered an extensive array of eclectic and unconventional topics as a journalist for The New Yorker and as the author of three bestsellers: The Tipping Point, Blink and Outliers. As a subscriber to The New Yorker, I’ve had the pleasure of reading many of Gladwell’s brilliant articles over the years. I’d first familiarized myself with his writing in 2004, when The Roots released their sixth studio album, The Tipping Point, named of course after Gladwell’s book of the same title. In the years since then, I’ve read his articles about ketchup varieties, a dog whisperer, hair dye and various secrets to success. Indeed, Gladwell’s periphery of focus is wide-ranging, but best of all it is rebellious, original and dare I say quirky – in a good way, of course! His latest offering, What the Dog Saw: And Other Adventures, is a collection of twenty-two of Gladwell’s greatest articles – self-professed “favorites” – from 1999 and onwards. Motivated by his deep-rooted curiosity, each of Gladwell’s articles is an eye-opening account on, as he puts it, the “minor geniuses” of daily life and work. Gladwell writes in his preface: “You don’t start at the top if you want to find the story. You start in the middle, because it’s the people in the middle who do the actual work in the world.” He continues: “People at the top are self-conscious about what they say… self-consciousness is the enemy of ‘interestingness’.” Sure enough, Gladwell’s “adventures” are nothing short of interesting. One particular article, which should raise some interest to our readers who participated in our past discussions of the legality of sampling in music, discusses the issue of identifying plagiarism, both in its legal and definitional terms. “Intellectual-property doctrine isn’t a straightforward application of the ethical principle ‘Thou shalt not steal’”, Gladwell writes, “At its core is the notion that there are certain situations where you can steal.” One such exemplar he employs is the Beastie Boys’ single “Pass the Mic” (Check Your Head, 1992) which samples James Newton’s jazz composition “Choir” (Axum, 1982). Gladwell goes on to form a firm stance that ought to please and certainly pique the curiosity of fans of old school or otherwise sample-based hip hop music. Gladwell also delves into serious societal matters which affect us today – many of which he offers retrospective comments on at the end of his articles – including issues such as economic meltdowns and strategies (Enron; Wall Street mastermind Nassim Taleb) and homelessness and its connection to sky-rocketing costs in healthcare (a must-read profile of the late Murray Barr, and the necessity for immediate responses to poverty). Devoid of any overt political bias, Gladwell’s writing embraces and highlights the realness and grit of humanity. What the Dog Saw: And Other Adventures is an engaging anthology that can be enjoyed in increments or all at once; it’s a quintessential perfect read for a plane or train ride. Gladwell’s brilliance in writing is only exceeded by the curiosity with which he chooses to explore the very topics he writes about. 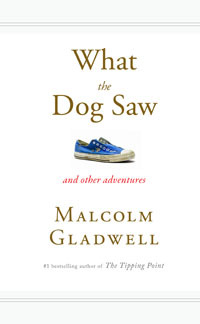 What the Dog Saw is a testament to Malcolm Gladwell’s propensity for finding new “adventures” to share with us. I've gotta pick this up, I really enjoyed Outliers. Thanks for the heads up! Nice heads-up, I like how this blog blends hip hop references and contemporary interests, like this book. Gotta get Tipping Point back from my bud so I can read it again and pick up this one.